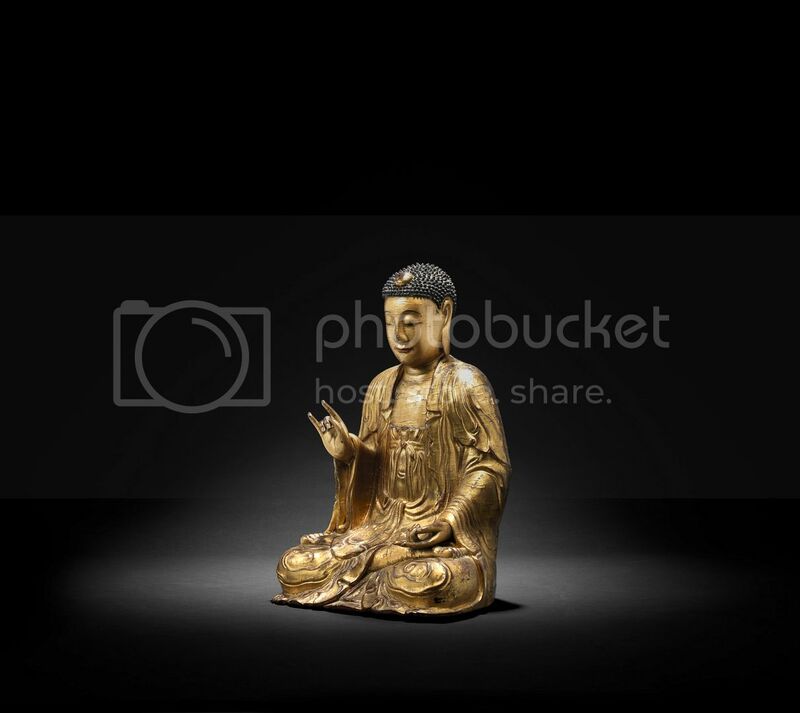 EXCEPTIONAL BUDDHIST GILT-BRONZE FIGURES LEAD BONHAMS’ FINE CHINESE ART SALE IN LONDON including a rare and large gilt-lacquered wood figure of Buddha, estimate £90,000 – 120,000. Bonhams will offer a range of carefully selected Chinese ceramics and works of art including jades, metalwork and rhinoceros horn carvings in the Fine Chinese Art sale, to be held on 12 November at Bonhams New Bond Street. Highlights of the sale include twenty-one exceptional Himalayan and Chinese bronze sculptures from the Jeanette Claude Jongen collection of Buddhist art, with attractive estimates ranging from £3,000 – 18,000 (Lots 70-90). The pieces are most notable for their rarity and exceptional quality. The Jongen collection was primarily assembled in the 1960s and 70s; the majority of the pieces were exhibited in 1978 and subsequently published in A. Neven, Etudes D’Art Lamaique et de L’Himalaya, Brussels, 1978. Of particular interest are a rare inscribed gilt-copper alloy figure of Arhat Bhadra, 17th century (Lot 80), and a large and rare gilt-copper-alloy figure of Shakyamuni Buddha, circa 16th century (Lot 73). Along with the Jongen collection, other rare Buddhist works of art will also be offered, including a rare and large gilt-lacquered wood figure of Buddha, 17th/18th century, estimated at £90,000 – 120,000 (Lot 69). The sale will begin with a selection of early ceramics from the Feng Wen Tang collection (Lots 1-15), comprising a range of Jian ware bowls from the Song Dynasty, with estimates ranging from £2,000 – 6,000. The auction will then feature a collection of Longquan celadon-glazed wares for the scholar’s desk from the 15th and 16th centuries, with estimates ranging from £4,000 – 40,000 (Lots 22-34). A rare documentary parcel-gilt pewter vase and cover, dated by inscription to the sixth year of Wanli period (AD 1578), estimated at £60,000 – 80,000 (Lot 59), is incised with panels enclosing scenes derived from the ‘Romance of the West Chamber’ reminiscent of illustrations in contemporary books. Four rare cloisonné enamel ‘flower’ panels, Qianlong/ Jiaqing periods (1735-1820), estimated at £100,000 – 150,000 (Lot 209), from the collection of Lady Anne Durston and thence by descent, are finely enamelled with auspicious flowers and motifs. A further Imperial work of art is a rare cloisonné enamel tripod incense burner, Qianlong (1736-1795), estimated at £20,000 – 30,000 (Lot 212), from a European private collection. It is a testament to the superb craftsmanship achieved by the cloisonné enamel ateliers during the celebrated Qianlong period. Also in the sale is a rare export painting by Tingqua (1809-1870), estimated at £20,000 – 30,000 (Lot 248), depicting various stages involved in the production and preparation of tea. The most famous and prolific of all Chinese watercolour and gouache painters was known to foreigners as Tingqua, though his true name was Kwan Luen Chin. Tingqua was the brother of Lamqua, an accomplished Chinese painter in the Western style who had been the protégé of the English painter George Chinnery. Tingqua chose gouache and watercolours as his medium in part out of familial deference to his older brother, who worked primarily in oils. Tingqua’s studio at 16 China Street, Canton, specialised in gouache and watercolour paintings influenced by Western artistic traditions. These works became known in America primarily through the American China trader Augustine Heard, who brought a substantial collection of Tingqua paintings back to the United States circa 1855. These are now located at the Peabody Museum in Salem, Massachusetts.